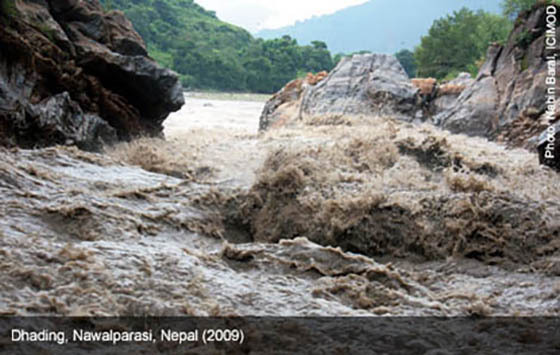 More than any other region in the world, South Asian countries in the Hindu Kush-Himalayan (HKH) region is hit by disasters the most, particularly recurring floods every year. This affects 92% of the population in Bangladesh, India, Nepal and Pakistan, according to a South Asian Disasters report of IFRC in 2005. In Bangladesh and parts of India, floods are a regular part of life. Climate change is expected to exacerbate this and will increase flooding and its virulence in the region in the months and years to come. This makes the need for a regional flood information system most urgent. In this direction, the International Centre for Integrated Mountain Development (ICIMOD) in collaboration with the World Meteorological Organization (WMO) organised an inception meeting for a project to establish a regional flood information system in the Hindu Kush-Himalayan (HKH) region. The workshop was held from 23-25 June 2010 in Kathmandu and involved the participation of six regional partner countries, Bangladesh, Bhutan, China, India, Nepal, and Pakistan. The participating countries and partner organisations reviewed the HKH-Hydrological cycle observation system (HKH-HYCOS) and project goals, and clarified concepts, as well as agreed on a common plan of action including roles and responsibilities of all the project partners. The workshop arrived at a common understanding on flood information sharing and mutual cooperation for enhancing flood risk reduction. The project is supported by the Government of Finland and is being implemented by ICIMOD in close collaboration with the WMO and six regional partner countries and builds upon the results of a preliminary phase of the project, which was implemented from 2001 to 2005 and included a series of consultative meetings with representatives from these countries. In his welcome address, ICIMOD Director General, Dr. Andreas Schild, said that “climate change and increase of floods in the region has amplified awareness of the need for a regional flood information system. The HKH-Regional flood information system project is considered a win-win situation for both upstream and downstream countries of the region”. Mr. Kari Leppanen, Representative of the Government of Finland, emphasised the values of water for sustaining livelihoods. The participants should convey to their decision makers the importance of regional flood information sharing and the need for enhanced coordination amongst the countries in HKH region, he said. The overall objective of the project is to minimise loss of lives and livelihoods by reducing flood vulnerability in the HKH region, with specific reference to the Ganges-Brahmaputra-Meghna and Indus river basins. The project aims to initiate timely exchange of flood data and information within and among participating countries through an established and agreed platform accessible to and useful for all the partners. 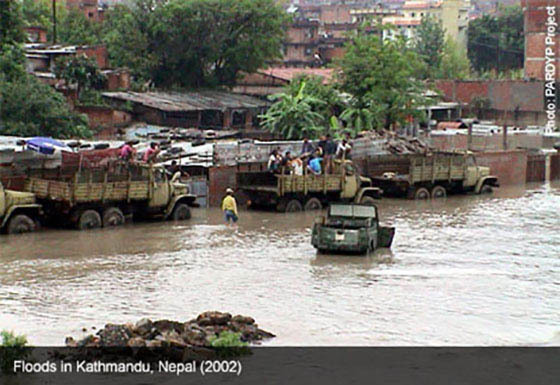 It seeks to develop and strengthen a regional framework for cooperation on sharing flood data and information between and amongst participating member countries through a common platform to be facilitated by ICIMOD. A regional and national flood information system will be established to share real-time or near real time data and information and thereby improve lead time for taking risk reduction measures. The project will include the enhancement of the technical capacity of partner organisations in flood forecasting and communication aspects and will also support with resources to procure the necessary equipment for rainfall and flow measurements in selected sites.